I feel a bit apologetic for the overindulgent vulgarity that is this cheesecake here. But, really, why should I be sorry? You won’t be once you’ve eaten it; though perhaps I should warn that it’s not for the faint-hearted. Unashamed indulgence, wallowingly so, is what this recipe is all about. For the base, process the biscuits, peanuts, dark chocolate chips and butter in a food processor. Once the mixture comes together in a clump, turn it out into a 23cm/9in springform tin and press it into the bottom of the tin and up the sides, using your fingers, to make a crunchy crust. Chill in the fridge while you make the filling. For the filling, process the cream cheese, eggs and egg yolks, sugar, soured cream and peanut butter in a food processor, whizzing to a smooth mixture. Pour and scrape the filling mixture into the cheesecake base in the chilled springform tin and cook for 1 hour, checking after 50 minutes. The top – only – should feel set and dry. 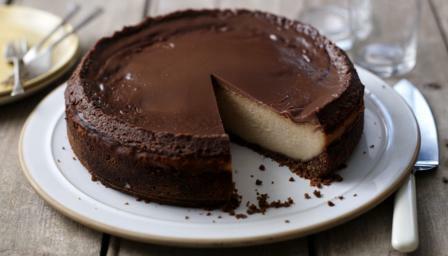 When cooked, take the cheesecake out of the oven while you make the topping. For the topping, warm the soured cream and chocolate chips with the brown sugar gently in a small saucepan over a low heat, whisking to blend in the chocolate as it melts. Once the mixture is melted and well combined, take off the heat. Spoon and spread the topping very gently over the top of the cheesecake, being as careful as you can in case you break the surface of the cheesecake. (Not that anything bad will happen; you’ll just have chocolate marbling the cake a bit.) Put it back in the oven for a final 10 minutes. Once out of the oven, let the cheesecake cool completely in its tin, then cover and put into the fridge overnight. When you are ready to eat the cheesecake, take it out of the fridge slightly in advance, just to take the chill off: this will make it easier to spring from the tin. Don’t let it get too warm, though, as it will become a bit gooey and be hard to slice.